The world holds so much garbage and so little good news. 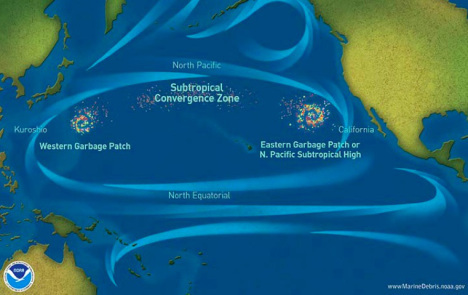 Patches of plastic debris accumulate where they are concentrated by ocean currents. FRISCO — Shredded bits of plastic now outweigh plankton in parts of the Pacific Ocean, posing a growing risk to to fish, turtles and birds that eat the trash. Efforts to limit the debris haven’t progressed much in the past few years, but new modeling of ocean currents may help researchers determine exactly where the waste is coming from. “In some cases, you can have a country far away from a garbage patch that’s unexpectedly contributing directly to the patch,” said Gary Froyland, a mathematician at Australia’s University of New South Wales. For example, the ocean debris from Madagascar and Mozambique would most likely flow into the south Atlantic, even though the two countries’ coastlines border the Indian Ocean. This entry was posted on 3 September 2014 at 7:20 PM and is filed under Uncategorized. You can follow any responses to this entry through the RSS 2.0 feed. You can leave a response, or trackback from your own site.